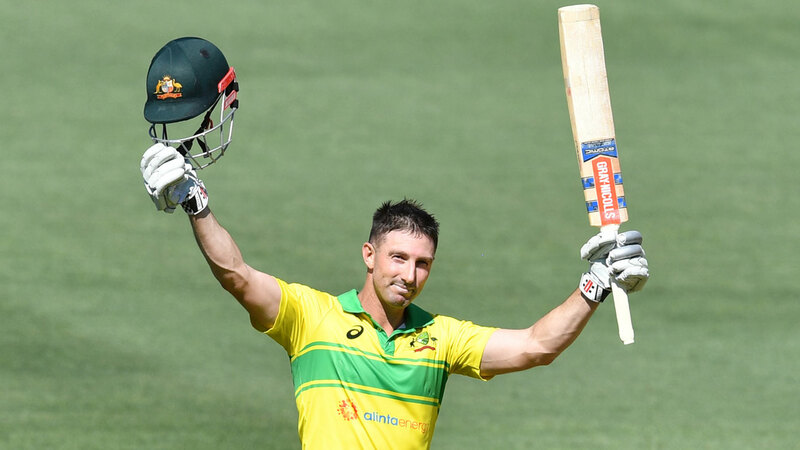 A sparkling Shaun Marsh century has helped Australia set India 299 runs to win Tuesday's one-day international in Adelaide. Marsh's 131 from 123 balls underpinned Australia's 9-298, with Glenn Maxwell adding a late flurry with 48 from 37 deliveries. Australia entered game two at Adelaide Oval with a 1-0 lead in the three-game series and eyeing their first one-day series win in two years. Marsh, in 41-degree temperatures, reached his seventh ODI ton from just 108 deliveries. The lefthander cracked 11 fours and three sixes to equal his second-highest ODI score. Marsh flourished despite the frequent loss of partners - Alex Carey (18), Usman Khawaja (21), Peter Handscomb (20) and Marcus Stoinis (29) - who failed to cash in. Maxwell, again batting at No.7 and arriving at the crease in the 37th over, offered late momentum with five fours and a six but his fellow Victorian Aaron Finch again failed. Captain Finch aimed a big drive at a Bhuvneshwar Kumar (4-45) delivery but only managed an inside edge onto his stumps - the fifth time in his past eight ODI knocks he has been bowled. "There's a glaring issue there for the Australian captain," ex-Australian great Adam Gilchrist said while commentating for Fox Sports. "Bowled him through the gate again. It's a similar story." Finch was axed from Australia's Test team after making 97 runs at an average of 16.16 in the first three Tests in the just-completed series against India. And in Saturday's series-opening ODI in Sydney, Finch was also bowled for six by Kumar. Finch struggled as well in Australia's ODI series last November against South Africa, making 57 runs at an average of 19 in the three-match series.